I'm going to let you in on a little secret. You know all those wonderful heads and pendants (like this oak leaf from Marla's Mud) I'm always showing you? (Yes, I may have a slight bead buying problem, but that's a discussion for another time.) There's a new online marketplace just for artisan made pieces - Artisan Component Marketplace. You won't find any factory produced knock offs there because each shop is juried before being allowed to sell on the site. That means each and every one of the pieces you find listed there will be hand made by the artist. You will find ceramic and porcelain, handpainted wood and lampwork as well as mixed media and metal. There are seed bead components made of tiny glass beads woven together in intricate patterns, pendants made from polymer clay and clasps made from wood. There are all sorts of little treasures from some of my favorite artists, so when I had an offer to do a guest blog post for them, I jumped at the chance. 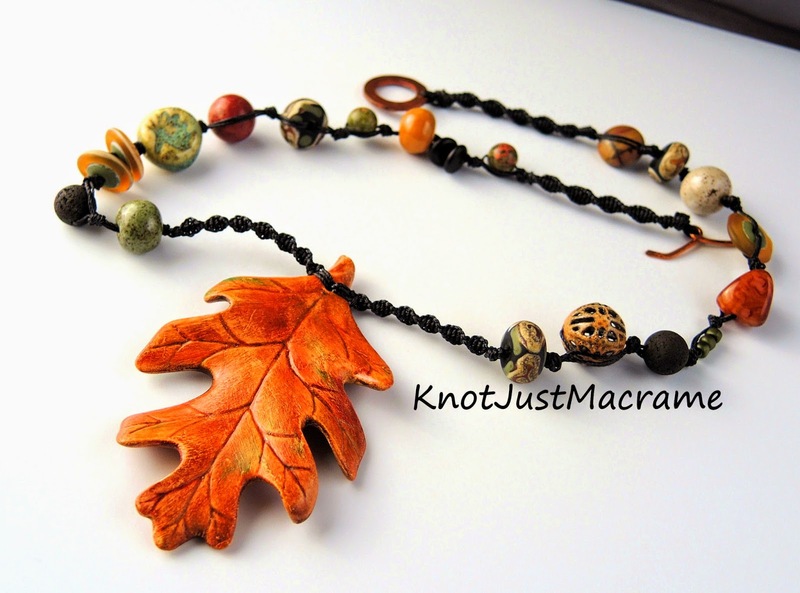 You're going to have to go there to see what I wrote, but I will give you a hint: it involves Marla's ceramic leaf pendant and a little free macrame tutorial. Have fun! Oh, and I made up a fancy new, handy-dandy bar for the bottom of my guest post - what do you think? Good article and very informative. So glad to know they are all in one place. Thank you.